Ernest Hemingway was the original “Most Interesting Man in the World.” In 2002 when I heard that Hemmingway’s library in Cuba would be digitized I pushed for Documentum to get involved. I was ready to volunteer my skills and my vacations to the effort. Documentum didn’t, but I didn’t forget the project. Growing up in Florida, Hemingway is an iconized representation of the Florida life. So as a records person when Hemmingway’s Cuba library was finally made available at the JFK Presidential Library, I was intrigued to see what was in the collection. It was the last item on the press kit that caught my attention, “Papa’s Favorite Hamburger” recipe. But let’s start with a little back story. Hemingway moved from Key West, Florida in the 1930’s to Cuba, where he would live through the 1950’s. He bought a small farmhouse just outside of Havana named Finca Vigia. It was here he would write parts of For Whom the Bell Tolls, winner of Pulitzer Prize for Fiction, and The Old Man and the Sea, contributed to a Nobel Prize for Literature. Hemingway would leave his home in Cuba in 1960, nine months before the Bay of Pigs Invasion. After the event, his home was taken over by the Cuban government, thus his library there for decades. Because of the embargo between the United States and Cuba since 1962, just getting access to this collection of documents was an interesting effort. With the work of both the U.S. and Cuban governments, along with Hemingway’s grandson, Finca Vigia Preservation Foundation and the Social Sciences Resource Council, a project was started in 2002 to make these documents available again. The team digitally scanned the 3,000 document collections first and then converted those into 15 roles of microfilm. This process was mandated by the technology embargo. It would be these rolls of microfilm, not the digital scans, which would allow researchers to study copies rather than the delicate originals. Two copies of the microfilm were made. One is in the Kennedy Presidential Library in Boston and the other is at the National Council of the Cuban Cultural Patrimony in Havana. 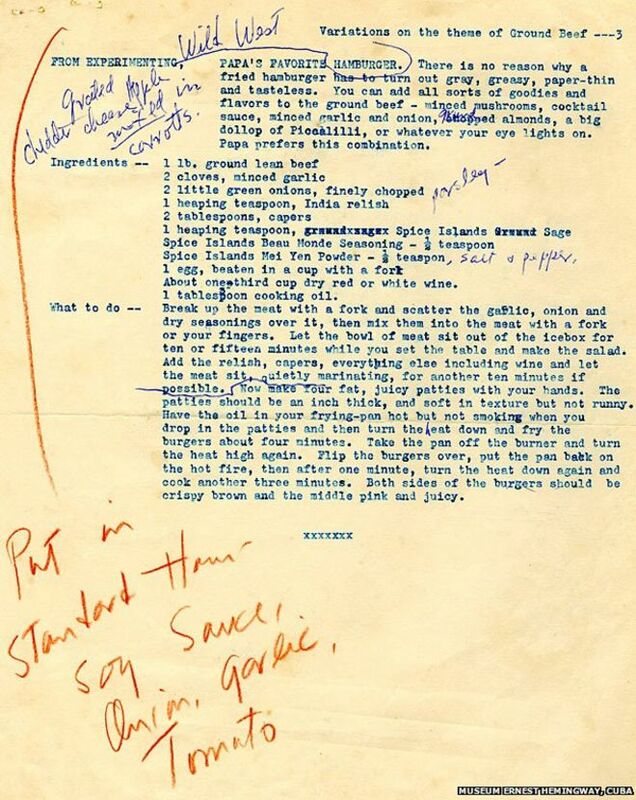 This opening of this collection, created the press kit that brought Papa (Hemingway’s) Favorite Hamburger recipe to light. Many would think that a recipe would be easy.Just follow the instructions. Not the case with this burger. Two of the ingredients are no longer made. And there are different interpretations of the document itself. Each of these challenges would require its own relative document knowledge to resolve. The page then continues with the recipe itself. Here’s where I think some publications got the recipe wrong. The page also includes two handwritten annotations, each in a different color of ink and a different handwriting. The majority of the notes written in blue seem to indicate annotations to the introductory narrative. The second note, in red ink, includes a line arcing to the narrative as well. These two annotations talk about cheddar cheese, apples, and carrots and soy sauce, onions, garlic, and tomatoes. I think a foodie would cringe at a hamburger recipe that included this laundry list of ingredients. Having looked at documents for years, I had a feeling these annotations were additional potential ingredients for the introductory narrative. I just needed to add the parsley, salt and pepper, as indicated by annotations next to the list of ingredients. My second challenge came when I bought some “India relish,” one of the ingredients that would be a challenge. I saw that it resembled every other relish on the market, chopped pickles in pickling liquid. I like relish, but I just couldn’t imagine this being part of this recipe. On a little bit of research, I discovered that the list of ingredients has been shortened over time in later versions of the recipe. I found a book in Google Books that had Heinz’s India relish’s original list of ingredients. That same search also led me to a food researcher that had gone down the same path. I used her recipe to recreate the relish. Fortunately the recipe to the second challenge ingredient, Mei Yen Powder, was much easier to find. My document research had given me the three recipes. Now, it was time to start building the burger. The relish would take the longest to make in preparation, cook, and pickling, so it went first. From dicing green tomatoes, onions, and cauliflower and then simmering and reducing the pickle took me a better part of the afternoon. At first taste I had a new star ingredient. Next the pickle had to rest. Two months later, on Labor Day, it was time to make the burgers. After making the second long-lost ingredient called for in the recipe, the remaining ingredients were mixed with the ground meat. Then after following the precise cooking instruction which called for varying the heat, my burger was finally completed.